I’ll be honest. I used to be a big Instagram user but got completely overwhelmed with how much work was involved. I just couldn’t keep up with the demand and eventually stopped posting completely. My big mistake? Not using the right tool to help me plan and schedule my content in advance. I recently discovered Tailwind for Instagram and it’s a game changer. I'm back on Instagram and loving every minute of it. But when it comes to monetizing the platform with affiliate links, you may find yourself confused or frustrated. It's just not as straight-forward to use with affiliate marketing compared to sites like Twitter and Facebook. The biggest mistake I see people make with affiliate marketing – on any platform – is picking the wrong products to promote. 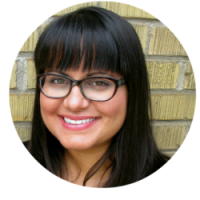 To choose the right products, you need to know what your audience’s biggest pain points and/or desires are. That way you’ll present products they'll want to buy because they solve their problems or fulfill their needs. In the above image, you’ll see that the target audience’s desire is to cook more but their pain point is that they’re busy. You might identify two products that’ll help them with both: a slow cooker and an Instant Pot. 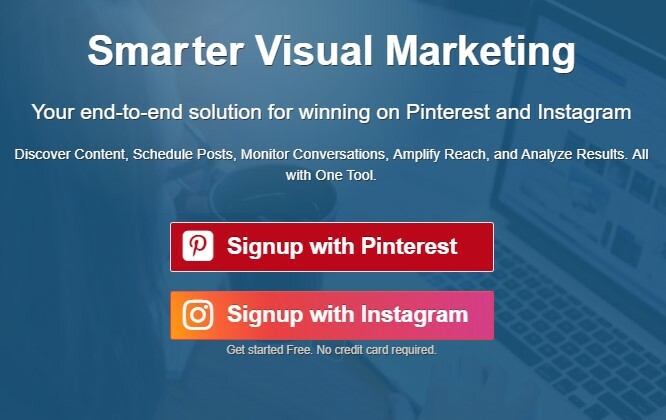 Now you just need to come up with Instagram posts centered around those products that keep your target audience’s pain point (being busy) in mind. When done right, hashtags help your target audience find your posts and follow you. But if you try to emulate larger accounts by posting no hashtags or using cute ones that are too broad or irrelevant, you'll struggle with growing your following and your Instagram affiliate marketing income. But don’t stop there. Try and get close to 30 hashtags (the max you can use) in each post. That way, you maximize the number of people finding your posts. 1. 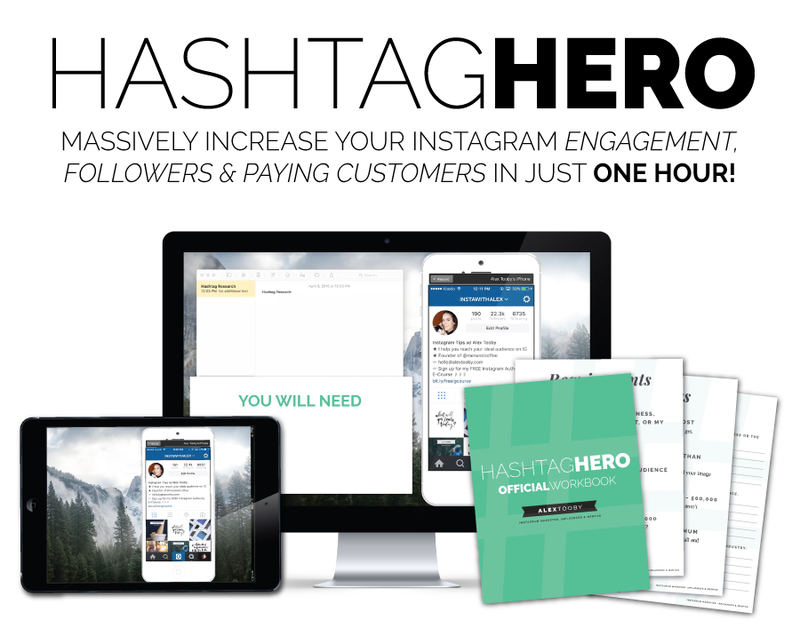 My friend Alex Tooby – who has 470K engaged Instagram followers and earns $5K a month in passive income – has a course called Hashtag Hero that goes into insane depth on all things hashtags. It includes step-by-step video tutorials, interactive workbooks, hashtag starter packs, and free updates. 2. Tailwind has a cool feature called Hashtag Finder that populates hashtags based on your caption. Later in this post, I'll show you exactly how to use it. A call to action (CTA) is marketing speak for something that encourages immediate action. For example, “click here to learn more” or “download my free guide” are both CTAs. Keep in mind, this goes beyond Instagram affiliate marketing. Basically, you’ll want to use a CTA when doing affiliate marketing in everything from blog posts and email campaigns, to Facebook and YouTube. Now if you’re concerned that using a CTA is too salesy, I hear you. But nowadays people are accustomed to seeing them. As long as you’re not using ALL CAPS, begging people to do something or using way too many in the same post, you’re golden. You can balance things out by doing it in every other post, or at a cadence that feels most comfortable to you. Personally, I don’t use a CTA in motivational or fun posts but everything else has one. 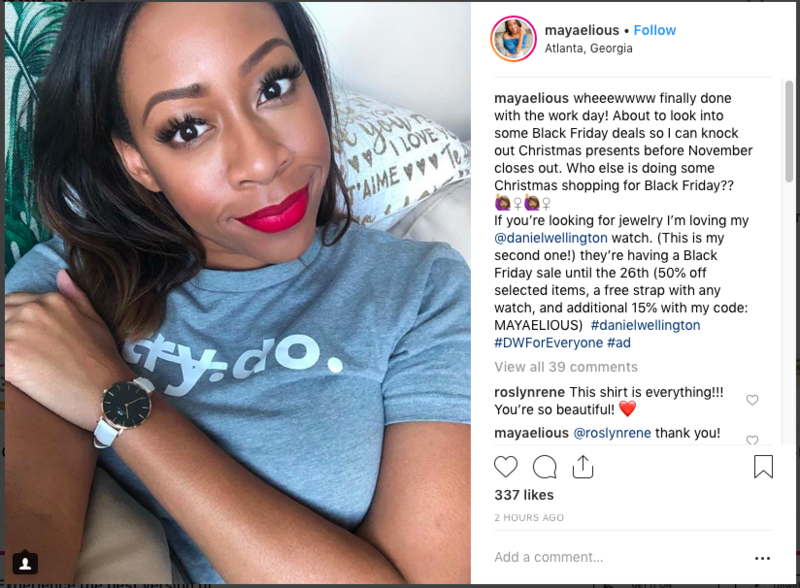 You need to disclose your paid relationship on every platform you do affiliate marketing, and that includes Instagram. A proper affiliate disclosure protects you and the companies you work with from the FTC, and is vital to preserving the trust you have built up with your following. 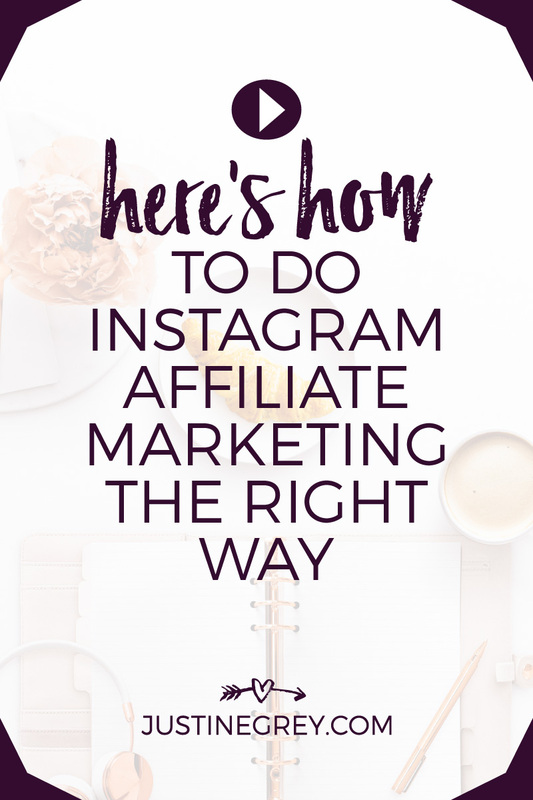 In a perfect world, your Instagram affiliate marketing posts will have #ad before or nearest to your first affiliate link, and a fuller disclosure blurb ( i.e. “this post contains affiliate links, meaning I will earn a small commission at no additional cost to you…”) in the caption as well. If you use affiliate links in your bio link, swipe up stories or on Linktree, you’ll need to find additional ways to clearly state that your affiliate relationship and what exactly that means. I think of Gary Vaynerchuk’s social media book Jab, Jab, Jab, Right Hook when it comes to Instagram affiliate marketing post frequency. In this case, a jab is an Instagram post that gives (i.e. creates engagement or evokes an emotional response) and a right hook is an Instagram post that takes (i.e. asking someone to buy an affiliate product). That’s why I try and do 3 jab posts (motivational content, fun stuff, affiliate answers, action steps, etc.) before a right hook post. Of course, you don’t have to follow that formula exactly. But try and avoid only creating affiliate posts or posting several of them in a row. Otherwise, you risk losing current followers and will have a hard time keeping the new ones you get. 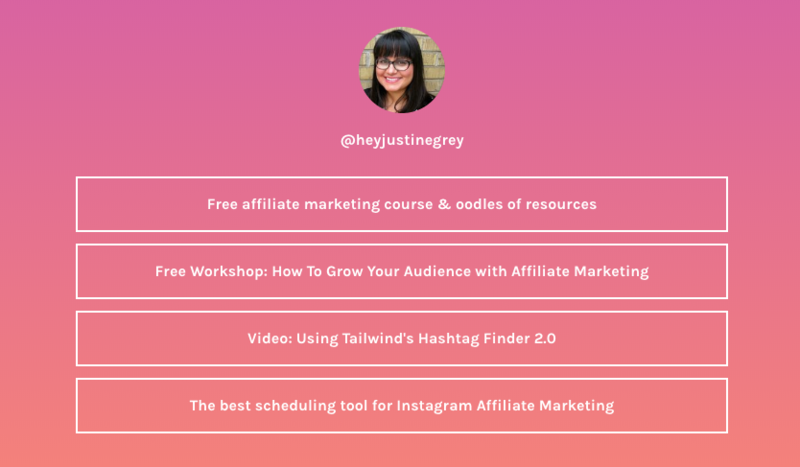 Want to start experimenting with Instagram affiliate marketing? 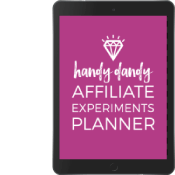 Enter your info below to grab my *free* Affiliate Experiments Planner. 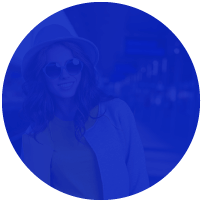 With it, you'll map out a year of amazing affiliate promos in a super fun way. We all know that you’re limited to a single link in your Instagram bio, so make it count! To get started, head to Linktree and create a free account using your Instagram login details. Click on the “+ADD NEW BUTTON/LINK” button on the left-hand side of your Linktree account and start adding your links. You will notice that there is space for the URL (which is where you’ll add your affiliate link) and space for a title of the link. The title of the link is all that your followers will see so make sure that it’s attention-grabbing and will entice them to click through. If you’d prefer not to use a third-party tool to have more control over the way your link page looks, you can create a page on your own website. Simply create a new page on your site and list the links – you can use text, buttons, images… anything you want. 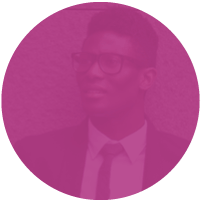 If you are a WordPress user, you could use a plugin like Elementor to build a really stunning page. 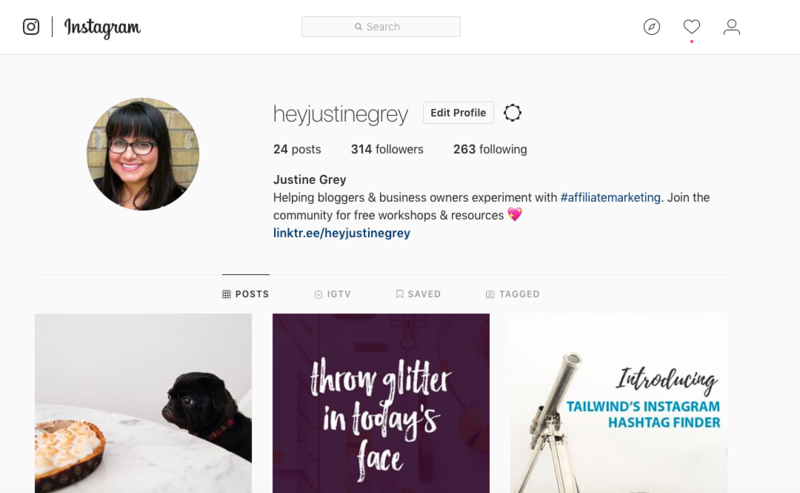 If you have more than 10,000 followers on Instagram, you'll be able to include affiliate links in your stories using the swipe up feature. When a follower chooses to “swipe up” on your story, they will automatically be following your affiliate link to the product or service page. You can include a shortened, easy-to-remember link in your story using a tool like bit.ly or Pretty Links – here's how to make the most of Pretty Links. This method does require your followers to remember the link, leave Instagram and input that link into their browser. For an easier way to share links with your followers, you can remind story watchers to click the link in your bio. Alternatively, you can go through the steps to get your Instagram account verified. Once your account is verified by Instagram, you will have access to the swipe up feature regardless of how many followers you have. To get your account verified, head to your “Settings”, find the option to “Request Verification” and follow the steps, which includes submitting relevant ID. Though not everyone who attempts this will be successful, it's worth a shot! Pro Tip: Save Instagram stories that include affiliate links to your story highlights. That way, people can view them after the 24 hour story period is up. The link in your bio section is the only place Instagram allows you to have a clickable link. That means any links you include in your image captions can’t be clicked on. It doesn’t, however, mean that you can’t include links. When posting pictures of products or writing about tools you’re an affiliate for, why not include your affiliate link? Just like I mentioned above, create shortened links using a tool like Bit.ly or Pretty Links so your followers don't have to remember long, complex affiliate links. They entice your audience to purchase the product because of the sweet deal you’re offering. Sometimes these coupon codes are tied to your affiliate ID, so your followers don’t need to click a specific link in order for you to get credit if they make a purchase. 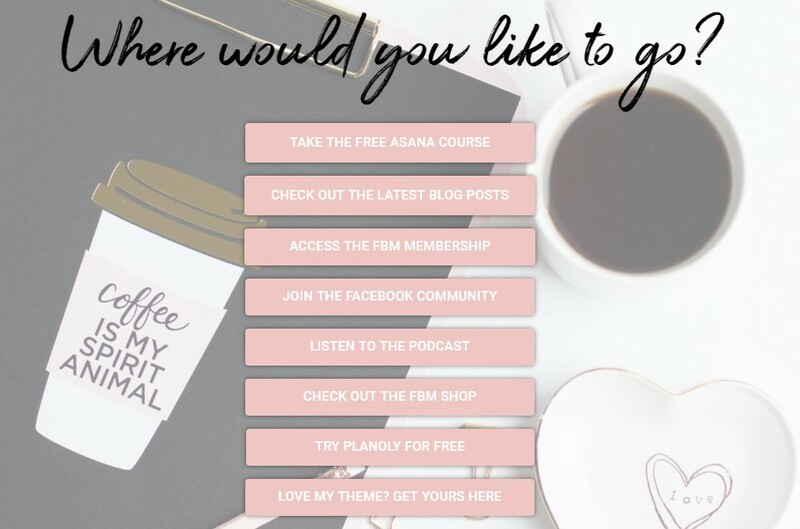 As I shared earlier, there's a game-changing tool I started using to help me with both Instagram in general and Instagram affiliate marketing. 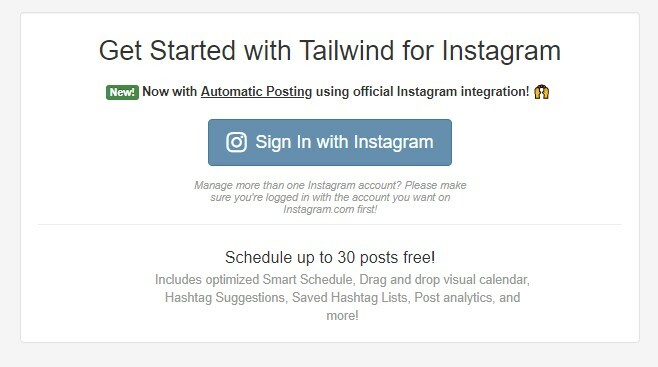 Many of you know about Tailwind as a Pinterest Management and scheduling tool, but did you know that you can use it for Instagram too? I'm so glad I recently discovered this because it's my new favorite thing. 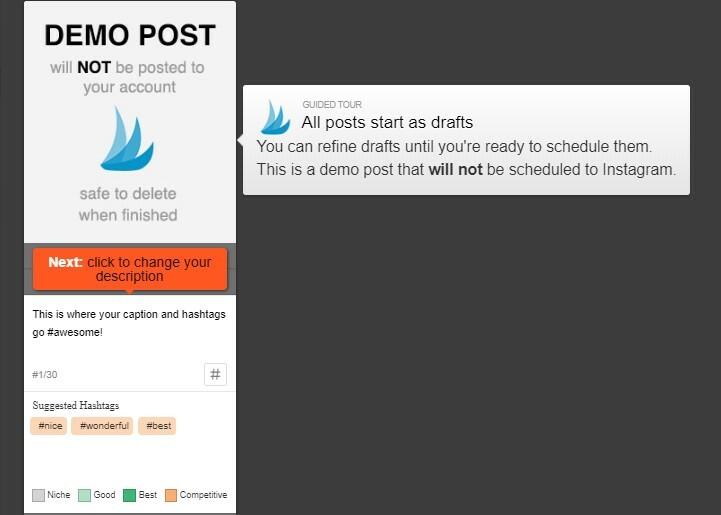 You can lay your posts out visually while scheduling upcoming posts. Tailwind makes it super easy to batch schedule content at once. The team is constantly innovating with fresh features, like Hashtag Finder 2.0 (more on that in a moment). Tailwind offers a fabulous free trial. Head to their homepage and select “Signup with Instagram”. 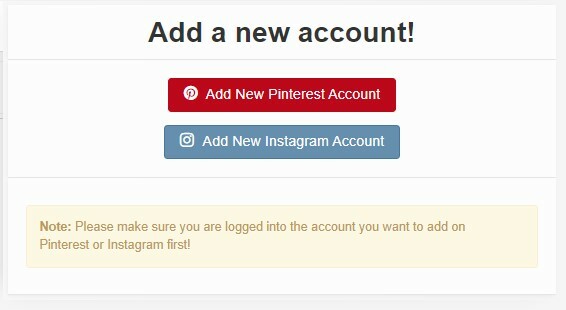 If you do already have a Tailwind account for Pinterest, log in to your account in the usual way and click on “Add New Account” under your profile, then select “Add New Instagram Account”. 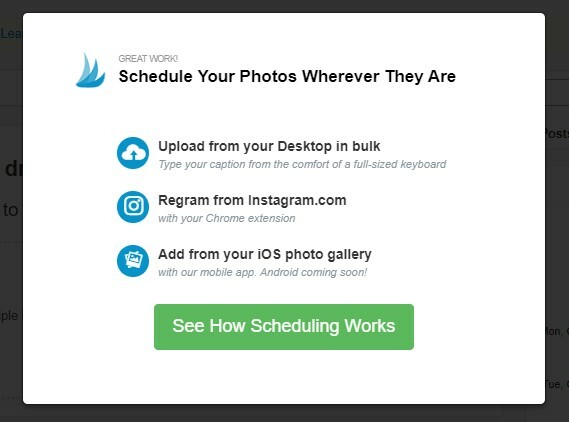 Luckily, scheduling content for your Instagram feed is super simple using Tailwind. You can either upload your own images or use the Tailwind Browser Extension to schedule posts from other websites. As I shared above, hashtags are *so* important and one of my favorite features from Tailwind right now is their Hashtag Finder 2.0. 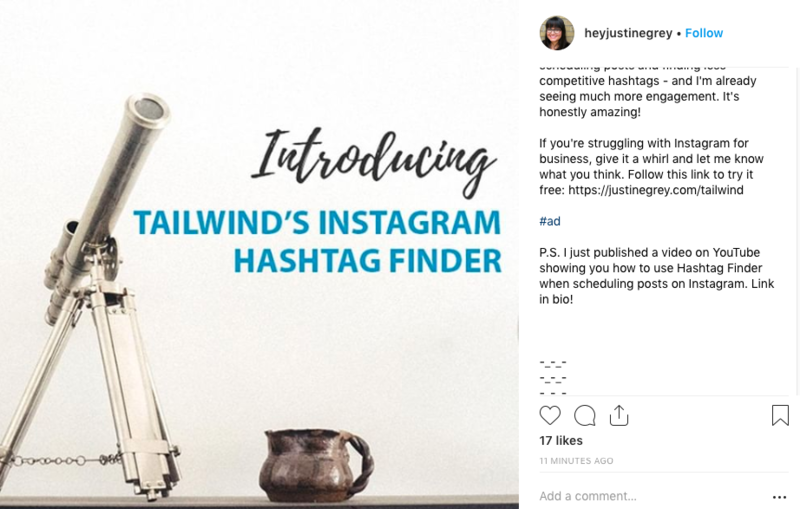 All you have to do is start typing the caption for your image and Tailwind's Hashtag Finder will suggest related hashtags for you to choose from. Each of those suggested hashtags is color-coded to show you how effective and competitive the hashtags are. The more you type, the more suggestions appear in the hashtag box below your caption. Simply select the hashtags you want to use from the suggestions box. You can then save these as a list to be used again if you want to (which will save time in the long-run). Hashtag Finder is relatively new so it’s not perfect yet. If you’re having trouble getting the hashtags you want, my best tip is to manually type in one or two hashtags your target audience uses. You'll quickly see that Hashtag Finder adapts and starts suggesting more relevant options. 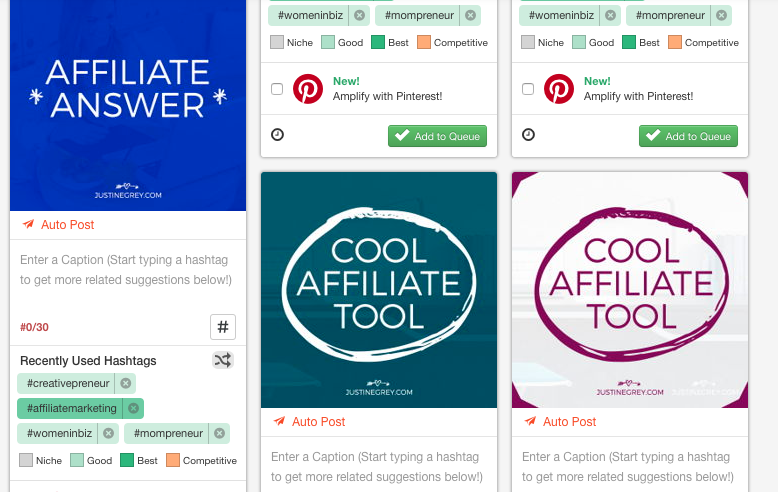 Pro Tip: If you're creating affiliate posts, don't forget to include the hashtag #ad. Once you have your image, caption, and hashtags all lined up for your post, it’s time to start scheduling. 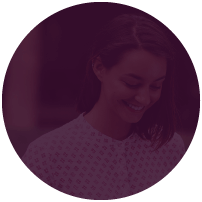 As with their Pinterest Scheduler, Tailwind will suggest optimal times for you to share content on Instagram. Or, you can set your own schedule by selecting “Schedule” from the left-hand menu. Tailwind will already have a list of times scheduled out for you based on your audience. You can either leave these as they are or update them yourself. For example, Tailwind has automatically added scheduling slots multiple times each day but I only want to do 1-2 posts a day so I'd personally adjust this. And that’s all there is to it! Easy, right? At the beginning of this post, I explained that I only started using Instagram again recently. In fact, I deleted all the content from my original account and started fresh! In the past I found Instagram to be too much work, but with Tailwind, the process is much simpler. Now if you anything like me, one-off posts aren’t your thing. You’re all about batch tasking content so you can get a week or more of Instagram posts done in advance. I love that Tailwind lets me upload unlimited photos at once so I can quickly schedule a week's worth of content at once vs. doing posts one by one. This may sound crazy, but I currently have 86 images in the system. Talk about easy scheduling! 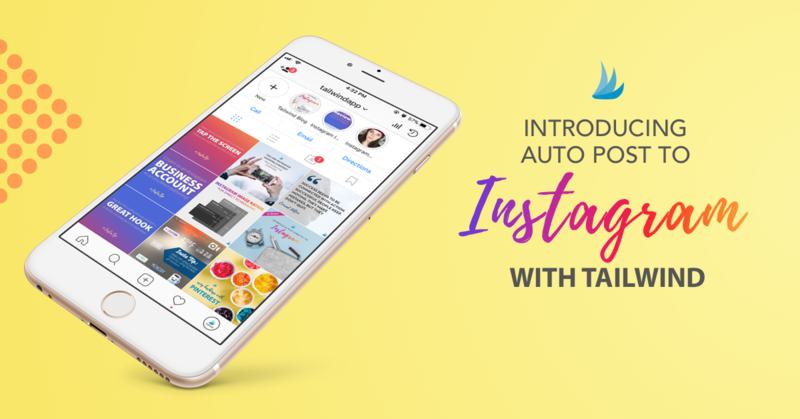 As mentioned briefly in the video, you can automatically post to Instagram with Tailwind if you have an Instagram business account. That’s right, no more push notifications and manual posting from your phone! You’ll get access to Instagram insights, which shows you historical data on your post performance and a look at who’s engaging and following you on the platform. A contact tab will show up on your profile, which followers can use to phone or email you depending on your settings. You’ll be able to promote posts and test out Instagram advertising. To switch to an Instagram business account, click on your settings (gear) icon and find “Switch to Business Account”. You’ll need to connect with your Facebook account and add your contact details in order to make the switch, but it’s a fairly painless process that only takes a few minutes. Finding success with Instagram affiliate marketing is possible with the right approach. I hope the tips and techniques I shared above will make creating or growing your affiliate earnings on the platform easier and more fun. I didn’t think I’d ever return to Instagram but I’m so glad I did. Thanks to Tailwind, I’m able to whip up affiliate posts in a flash and am seeing more followers and engagement than ever before. Click here to start using Tailwind for free. 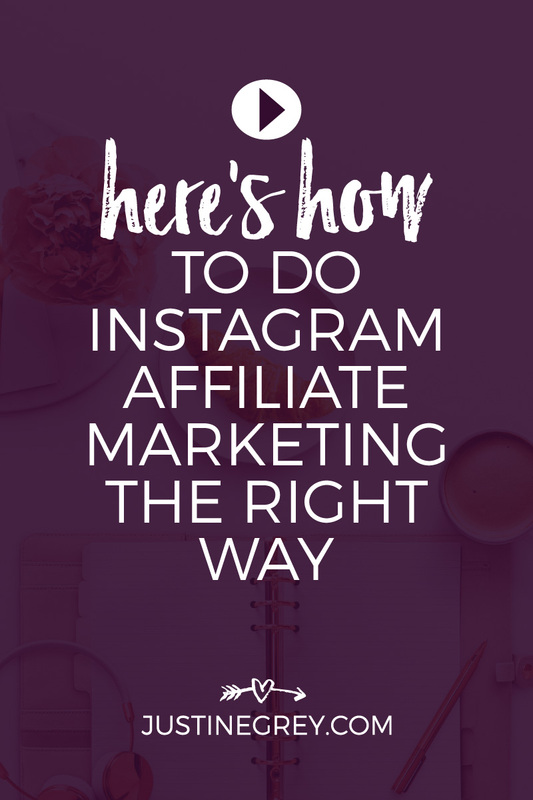 Are you trying Instagram affiliate marketing? If so, I'd love to hear your experiences in the comments below.